Brother Can You Spare a Kidney? It is not easy to go down to Ambleside Beach in West Vancouver on a bright Sunday morning, for a fun walk along the seawall to benefit the Kidney Foundation, and end up looking into the eyes of a young lady who has set up her own booth and who explains she is doing this because otherwise she could die. She needs a kidney transplant urgently and no kidneys are available right now for her. So Monika Colmorgen has resorted to wearing a t-shirt emblazoned in big letters “I NEED A KIDNEY.” She manages a smile for my camera. Here are some troubling facts: Approximately 425 British Columbians are waiting for a life-saving kidney transplant. The number of transplant operations actually performed this year will be about half that number. In other words, need far outweighs availability. Some organs that could be available for transplant are lost because the willingness of the deceased to become a donor is not known by their family – or anybody else – because they did not register. Many awaiting a transplant die before a suitable organ becomes available. Monica Colmorgen explained to me the basics of kidney failure: when it occurs, it is necessary for the blood to be cleansed mechanically through a daily process called “dialysis.” It is no longer necessary to go to the hospital for dialysis; a modern dialysis machine may be hooked up to your body by yourself before you go to bed. It is noisy, but it works – for a time. Unfortunately, dialysis treatment is effective only for a limited period. Time is therefore of the essence. How common is it? Very. Close to 2.5 million Canadians have diagnosed diabetes; about 6.8% of the population. 4 million Canadians are affected by chronic kidney disease or 1 in 10. 15 Canadians are diagnosed with kidney failure every day. How many diabetics will develop kidney disease? About 30 percent of patients with Type 1 (juvenile onset) diabetes and an astounding 10 to 40 percent of those with Type 2 (adult onset) diabetes eventually will suffer kidney failure. This leads to an urgent need for a lot of organ transplants. Kidneys become available when a registered donor dies – if the timing, DNA match, donor health circumstances, and geographic availability are perfect. As well, donations from live donors occur; the body can get along just fine with one instead of two – if your friend or relative will volunteer. Currently, more than 900,000 British Columbians are registered as organ donors. Are you? To register takes about five minutes. Google “BC Organ Donor Registry.” Type in your BC Personal Health Number, name, birth date, and address. Done! For an actual organ donation to take place, you must be in a critical care hospital ward being sustained by a breathing machine, with no hope of recovery. Once death is declared and the appropriate conversation has taken place with the family, BC Transplant is contacted by hospital staff to verify the patient’s prior decision. Transplants are limited by public awareness and understanding – which takes money. 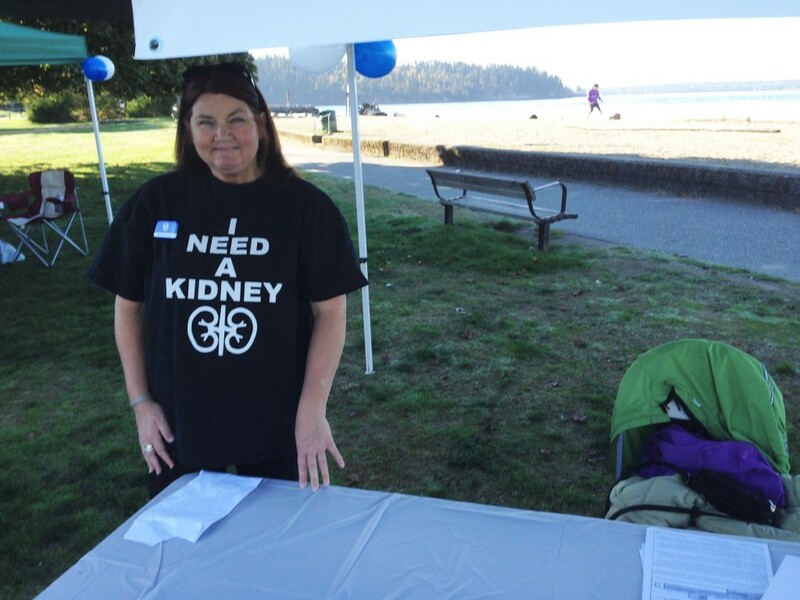 For the Kidney Walk in which I participated – one of 25 around the province – more than $38,000 was raised by such teams as Club Ned, Marj’s Marchers, ROLO Roadshow, 3 Bean Chicks, Bob’s Team, and Anastasia. Top fund raisers included Edward Quilty, Gail Ross, Elaine Andrews, Karla Walters, Erin Reimer, Lindsey Black, Lorrie Nevison, Bob Johnstone, and Jennifer Choi. I did not ask, but suspected many of them had a strong personal reason to be there. I had my own personal reason: I am a registered donor. So was my wife, a nurse who died suddenly. Somewhere out there, some parts of Shirley are probably still alive, helping somebody else live a full life. Several months ago, I talked to a former local school trustee about the government’s plan to train more welders and plumbers as part of its Jobs Plan. The lofty reply was that in this particular North Shore school district, parents expected their kids to become doctors and lawyers, not tradespeople. In other words, the government’s ambitious training program (“Find Your Fit”) was mis-directed. Maybe so, but they should be mindful of the story of North Vancouver’s Paul Meyers. At age 19 Paul Myers was apprenticed to Keith Plumbing and Heating, which then — and now — will come and fix your leaky faucet. A dozen years later he bought the company — then and now a union shop. He built this company into a 200-strong commercial contractor, well respected for quality work and on-time delivery. Fast forward 60 years from the time Paul Myers started his apprenticeship. A couple of months ago, the North Shore received a very healthy gift from this quiet and unassuming person: $25 million to Judy Savage’s Lions Gate Hospital Foundation — the largest single donation from any citizen to a hospital foundation in our province’s history. The money will help finance a new tower on the Lions Gate campus. In the interim, South Acute tower will be named after him. Paul knows his hospitals, having worked on more hospitals than any other contractor in B.C. He also understands excellence. In 2015, his company was recognized for excellence in plumbing the most modern shipyard in the world: Seaspan in North Vancouver. He also understands the excellent medical services he, his family, and his employees have received from Lions Gate Hospital over the years. Paul Myers didn’t inherit $25 million; he earned it and saved it one dollar at a time. And gave it back to our community. For that, Paul Myers deserves a big “thank you!” from all of us. What Can a Handful People Do? 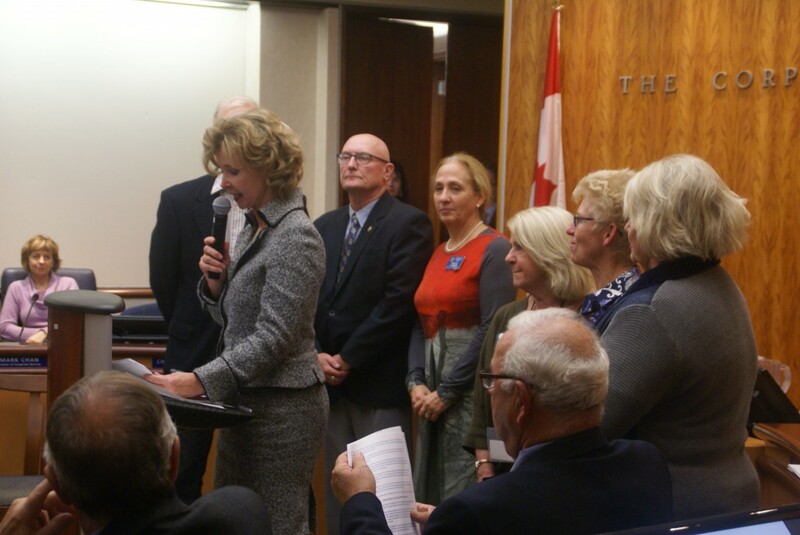 Carolanne Reynolds, reporter and royalist: Carolanne is a “council watcher” and newsletter publisher who somehow records, via shorthand or scribbled notes, much of what happens at our municipal council meetings week after week, year after year — without fail. A form of Hansard for future generations. Carolanne is also organizer of the North Shore’s annual tribute to the Queen via “RoyalTea” on Ambleside Beach, featuring, yes, tea and crumpets, yellow roses, and large floppy hats – as well as vintage British sports cars. There they are, parked on the sand: a British Racing Green 1955 MG with the manual top down, next to Marnie Pearson’s elderly Rolls Royce. RoyalTea also allows me to stand on the beach and deliver impromptu remarks about the merits of the British Parliamentary System of Government under which I serve, and which I believe, warts and all, serves our democracy well. James Stout, youth leader: James has served 47 years as scoutmaster in West Vancouver, during which time he has endeavoured to teach, by example, approximately 1,000 young men in the virtues of nature, self-reliance, hiking and camping in the outdoors, and being prepared for – and anticipating — any eventuality. In 1971, North Shore Scouts and Girl Guides built the Baden Powell Trail, named after the British founder of the world Scouting Movement. This wilderness trail cuts across the North Shore from Horseshoe Bay to Deep Cove, and trail usage grows year by year – yet another example of the community contribution of the Scouting movement. David Barker: historian: David has served the West Vancouver Historical Society for many years. His community roots go back to the 1900’s when his grandparents lived in a tent on the shore as they built their own home. His keen interest in preserving the history of West Vancouver motivated him to serve as President of the Historical Society on multiple occasions. He is editor and publisher of the Society’s newsletter “Memories,” eagerly awaited each quarter. Make donations to other causes, including the Seniors Centre, scholarships at Rockridge School, the West Van Library, Evergreen House seniors’ residence, Lions Gate Hospital Foundation, Honour House in New Westminster, which is a home away from home for the military, war veterans and first responders, the SPCA, and RCM-SAR, the Royal Canadian Marine Search and Rescue. That’s what 25 unpaid volunteers can accomplish in West Vancouver in one year. Oh yes, they also endeavor to set standards for personal conduct based on Rotary International’s four key questions: is it true, is it fair, will it build friendships, and will it benefit all concerned? In today’s ambiguous world, enduring guidelines indeed. Who Will Look After North Shore Seniors? In West Vancouver, the question of who will look after the seniors is hardly academic; they are almost one quarter of our population. North Vancouver District, also part of my riding, will probably get there soon. Well, some might say, government will surely provide me with a place to live, with gourmet meals and valet service. Think again, folks. That was my message as I toured the province in my brief moment of fame as Seniors Minister. Fortunately, nobody threw a shoe at me. It turns out government-subsidized seniors residential care beds on the North Shore are equal to just over 4% of the seniors’ population. Adding to that an approximately equal number of private-pay residential beds, in splendid places such as Amica, Hollyburn House and the Westerleigh, we may conclude roughly 8% of North Shore seniors could expect to find either a public or a private bed in a specialized facility. Many will continue to live at home, where they have always lived. Most of the seniors care at home will be provided by partners, spouses, family members, and close friends. A growing number of North Shore seniors won’t even live here much at all – they will spend part of their time someplace else. Also, a growing proportion of those 65 and older will refuse to be labelled as “seniors.” The ever-shifting cut-off when persons choose – or are forced to – “retire” climbs. However, it is also true that we live longer than ever before, so the cohort of elderly will hardly shrink. Modern medicine energetically tackles the aging process with considerable success. And we don’t need modern medicine to simply be smarter about what we eat and how much we exercise. But many seniors will eventually find themselves living alone. Sooner or later, help is required. Here is where the North Shore Volunteers for Seniors can help: about 50 volunteers – many of them nominal “seniors” themselves – “looking after” more than 150 other seniors, mostly in the 80s and 90s age category, many living alone. A three-to-one ratio. Seniors looking after seniors. There are about six such organizations on the North Shore serving, by my guesstimate, about 1,000 or another 4% of the seniors population. At home. The North Shore Volunteers for Seniors has recently had a changing of the guard. Long-time Executive Director Trudy Hubbard has moved on to head the combined Kiwanis Care Home facilities of both West and North Vancouver. She has been replaced by somebody with a familiar face, Christine Holmquist. Familiar to me at least, since I was surprised to learn that Trudy had recruited my niece to fill her old job.